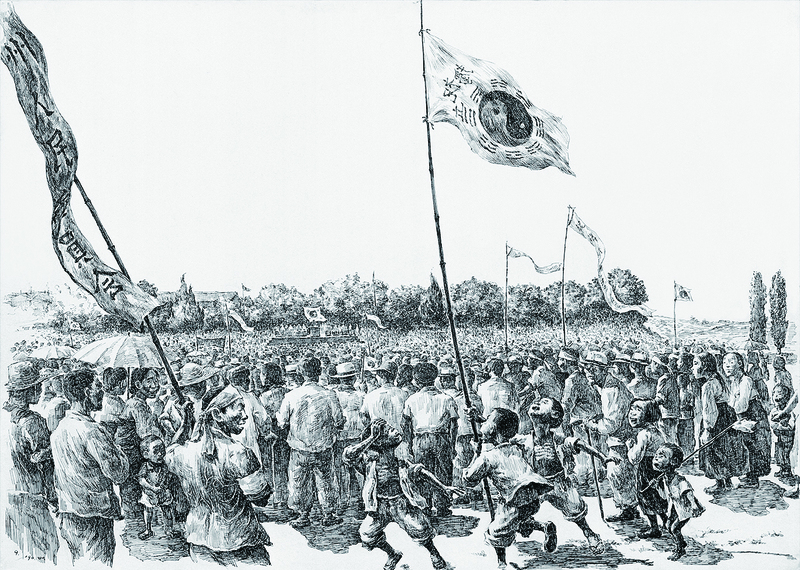 “The Liberation” (1990) by Jeju artist Kang Yo-bae depicts the crowd congregated in Jeju City to simultaneously celebrate the March 1 Independence Movement and protest the upcoming general elections. Conflict boiled over on March 1, 1947, during an event to commemorate the March 1 Independence Movement. This tragic incident, known as the March 1 Shooting Incident, triggered the Jeju 4·3 Uprising and Massacre. On March 1, commemorative ceremonies were held nationwide, including in Seoul, to mark the 18th anniversary of the March 1 Independence Movement. In Jeju, a March 1 Independence Movement event was held at Buk Elementary School in Jeju City. Unlike in Seoul where separate ceremonies were held by left-wing and right-wing groups, in Jeju only one ceremony was held due to the absence of political conflict on the island at the time. This led to an unprecedented number of people gathering and calling for unequivocal independence and a better society. Faced with the deteriorating situation following independence, people struggled to overcome hardship and strived to rekindle the spirit of resistance against Japanese rule. This is the mood in which the ceremony to commemorate the March 1 Independence Movement was held in Jeju. Around 30,000 people gathered at Buk Elementary School under the slogan “Let’s achieve unification, independence in the spirit of March 1.” The Korean people believed that they had suffered following independence due to lingering foreign control over the country’s fate. With the Soviet Union and the U.S. exercising control over the north and south of the country, respectively, Koreans were also worried about potential national division. As such division would likely lead to war, they called for unification and independence. In other words, Koreans believed that if they were able to establish an independent country free of foreign influence, then the social conflict would naturally be resolved. 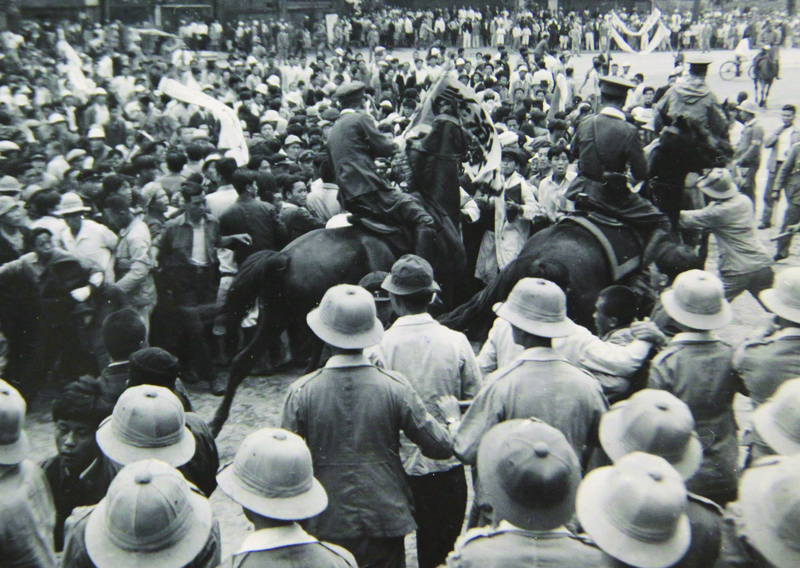 Mounted police officers of the U.S. Military government make their way through a crowd on the mainland.